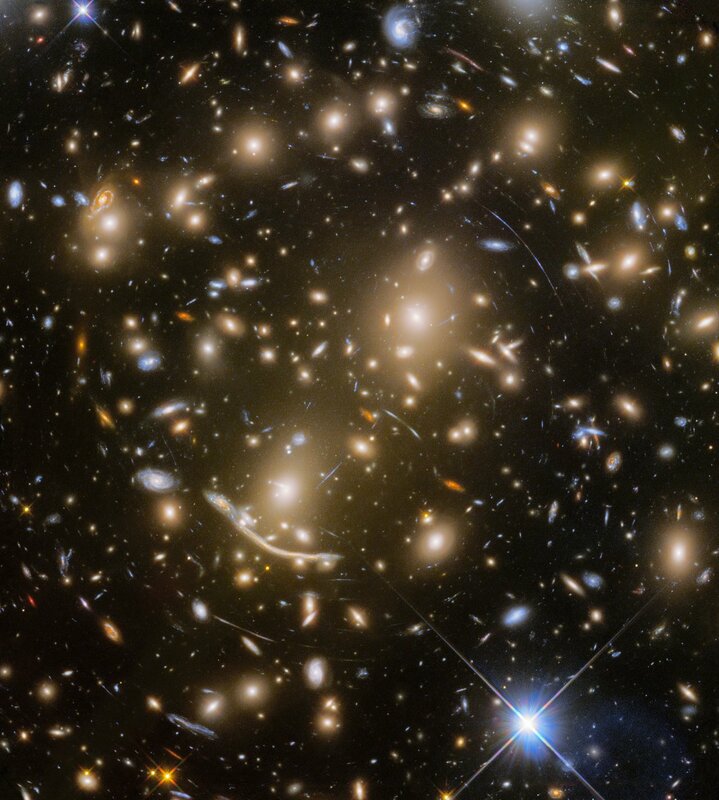 New Hubble project provides wide-field view of the galaxy cluster Abell 370. The universe is a big place. The Hubble Space Telescope’s views burrow deep into space and time, but cover an area a fraction the angular size of the full Moon. The challenge is that these “core samples” of the sky may not fully represent the universe at large. This dilemma for cosmologists is called cosmic variance. By expanding the survey area, such uncertainties in the structure of the universe can be reduced. A new Hubble observing campaign, called Beyond Ultra-deep Frontier Fields And Legacy Observations (BUFFALO)[Caltech], will boldly expand the space telescope’s view into regions that are adjacent to huge galaxy clusters previously photographed by NASA’s Spitzer and Hubble space telescopes under a program called Frontier Fields. The six massive clusters were used as “natural telescopes,” to look for amplified images of galaxies and supernovas that are so distant and faint that they could not be photographed by Hubble without the boost of light caused by a phenomenon called gravitational lensing. The clusters’ large masses, mainly composed of dark matter, magnify and distort the light coming from distant background galaxies that otherwise could not be detected. The BUFFALO program is designed to identify galaxies in their earliest stages of formation, less than 800 million years after the big bang. The galaxy cluster Abell 370 was the first target of the BUFFALO survey, which aims to search for some of the first galaxies in the Universe. This remarkable cluster in the constellation of Cetus is located approximately four billion light-years away. Its mass, consisting of both hundreds of galaxies and dark matter, bends and distorts the light coming from even more distant objects behind it. This effect is known as strong gravitational lensing. With the final observation of the distant galaxy cluster Abell 370 — some five billion light-years away — the Frontier Fields program came to an end. Abell 370 is one of the very first galaxy clusters in which astronomers observed the phenomenon of gravitational lensing, the warping of spacetime by the cluster’s gravitational field that distorts the light from galaxies lying far behind it. This manifests as arcs and streaks in the picture, which are the stretched images of background galaxies. This image composite shows the new observations of Abell 370 made for the BUFFALO project, as well as the old observation made for the Frontier Fields programme. The composition clearly shows the extended field of view in the new observations. Credit: NASA, ESA, A. Koekemoer, M. Jauzac, C. Steinhardt, the BUFFALO team and HST Frontier Fields. The immense mass of galaxy clusters like Abell 370, mainly composed of the mysterious dark matter, bends and magnifies the light of these faraway objects, turning these clusters into natural telescopes. This gravitational lensing effect allows scientists to see further into space beyond the cluster, by capturing the light emitted by very distant and faint objects. The most stunning demonstration of gravitational lensing in Abell 370 can be seen just below the centre of the cluster. Nicknamed “The Dragon” this feature is a combination of five gravitationally lensed images of the same spiral galaxy that lies beyond the cluster. Although Hubble has already detected some of the Universe’s earliest galaxies through its Frontier Fields programme, these fields are relatively small and might not fully represent the number of early galaxies in the wider Universe. BUFFALO builds upon these observations using gravitational lensing, and will expand the search area around the six Frontier Fields previously observed by Hubble. Abell 370 is the first cluster to be observed. BUFFALO will investigate how and when the most massive and luminous galaxies in the Universe formed and how they are linked to dark matter assembly – the constraining effects of which are an essential factor in how the Universe looks today. The survey will also learn more about the evolution of lensing galaxy clusters and will give clues on the nature of dark matter. The first step is making a detailed a dark matter mass map of these massive galaxy clusters in order to measure exactly by how much the lensed galaxies are being magnified. The programme will determine how rapidly galaxies formed in the first 800 million years after the Big Bang – paving the way for observations with the upcoming NASA/ESA/CSA James Webb Space Telescope. Massive galaxy clusters like Abell 370, which is visible in this new image, can help astronomers find more of these distant objects. The immense masses of galaxy clusters make them act as cosmic magnifying glasses. 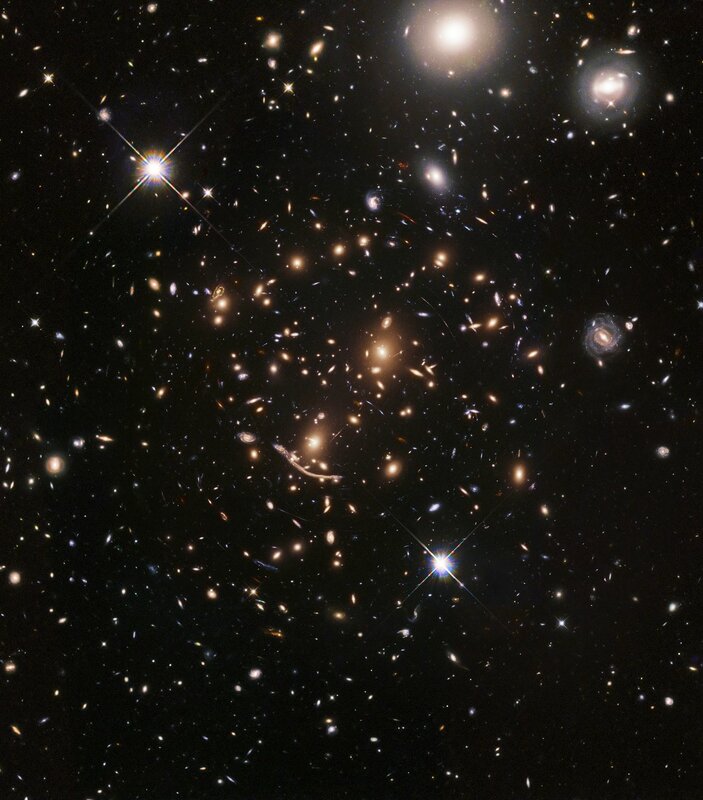 A cluster’s mass bends and magnifies light from more distant objects behind it, uncovering objects otherwise too faint for even Hubble’s sensitive vision. Using this cosmological trick — known as strong gravitational lensing — Hubble is able to explore some of the earliest and most distant galaxies in the Universe. Numerous galaxies are lensed by the mass of Abell 370. The most stunning demonstration of gravitational lensing can be seen just below the centre of the cluster. Nicknamed “the Dragon”, this extended feature is made up of a multitude of duplicated images of a spiral galaxy which lies beyond the cluster. This image of Abell 370 and its surroundings was made as part of the new Beyond Ultra-deep Frontier Fields And Legacy Observations (BUFFALO) survey. This project, led by European astronomers from the Niels Bohr Institute (Denmark) and Durham University (UK), was designed to succeed the successful Frontier Fields project . 101 Hubble orbits — corresponding to 160 hours of precious observation time — have been dedicated to exploring the six Frontier Field galaxy clusters. These additional observations focus on the regions surrounding the galaxy clusters, allowing for a larger field of view. BUFFALO’s main mission, however, is to investigate how and when the most massive and luminous galaxies in the Universe formed and how early galaxy formation is linked to dark matter assembly. This will allow astronomers to determine how rapidly galaxies formed in the first 800 million years after the Big Bang — paving the way for observations with the upcoming NASA/ESA/CSA James Webb Space Telescope. Driven by the Frontier Fields observations, BUFFALO will be able to detect the most distant galaxies approximately ten times more efficiently than its progenitor. The BUFFALO survey will also take advantage of other space telescopes which have already observed the regions around the clusters. These datasets will be included in the search for the first galaxies. The extended fields of view will also allow better 3-dimensional mapping of the mass distribution — of both ordinary and dark matter — within each galaxy cluster. These maps help astronomers learn more about the evolution of the lensing galaxy clusters and about the nature of dark matter. This zoom starts with a ground-based view of the sky and zooms in on the distant galaxy cluster Abell 370, as seen by the NASA/ESA Hubble Space Telescope. The mass of the cluster is large enough to bend the light of more distant objects along the line of sight. This creates interesting distortions, fascinating arcs and it even magnifies objects which would otherwise be to faint and tiny to be seen by Hubble. To many, Hubble is best known for its stunning images of celestial objects, but among astronomers it is admired for the valuable data it delivers. Hubble has helped revolutionise astronomy, including shedding light on dark matter and dark energy, lifting the veil on black holes, and peering into the dusty regions around stars to image exoplanets. This new Hubblecast is the second part of an exploration of some of Hubble’s most important discoveries throughout its history. More information and download options: http://www.spacetelescope.org/videos/&#8230; Subscribe to Hubblecast in iTunes! See the Caltech BUFFALO Project Website here. See the full ESA article here . See the full NASA article here . See the full Durham University article here .